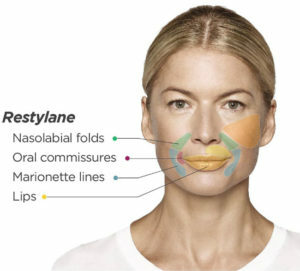 Restylane is the first FDA approved biodegradeable form of hyaluronic acid, providing patients with a smooth, long-lasting correction of facial wrinkles and folds. As a result of the aging process, less hyaluronic acid is produced. Restylane skin injection treatments work to replenish the skin with hyaluronic acid, thus adding moisture and volume back to the skin. One of the most significiant benefits of Restylane is that it is biocompatible with human hyaluronic acid. Restylane has been highly effective for the treatment of moderate to severe wrinkles in the facial area. Restylane injections are administered in the doctor’s office, typically for patients aged 35 to 60. It is most often performed with local anesthesia, especially if the lip is being treated. Since Restylane contains no lidocaine like collagen, patients may experience some pain and discomfort from the needle during injection. Depending upon the extent of the treatment, the procedure can take from a few minutes up to 30 minutes. Patients return home shortly after the procedure. Step Three: The Restylane filler is then injected beneath the skin. Hyaluronic acid in the filler adheres to the skin as the water contained in the acid helps to retain volume under the skin’s surface. The acid acts as a magnet for water, which helps to preserve the renewed volume of the skin.